We’re at that point in the year where the last of the Winter vegetables are bumping up against the first of the Spring vegetables. At least – that’s true here in Helsinki, where the last pieces of ice hug the edge of the shore near the sea, slowly melting away, and where the migrant birds have finally returned to begin nesting in local waters. There is one Winter vegetable that landed on my table in early Fall, and is still something I pick up pretty much every week, because the flavor is just so good: Butternut Squash. This lovely squash, with its shapely curves and bold orange interior is not only beautiful to look at, it’s easy to cook and has flavor that needs very little tampering with in order to create a healthy and delicious meal. 1 cup/2 dl of of the squash provides 1/3 of the daily recommended amount of Vitamin C! it’s a surprising source of Omega 3 fatty acids: 1 cup of the squash provides 340mg of Omega3; although the squash itself is only about 15% fat. No wonder it tastes so silky smooth. in addition to the nutrients already mentioned, it is a very good source of fiber, manganese and copper and a good source of potassium, vitamin K, magnesium, and niacin. Naturally sweet, you can add this squash to any meal to combat sugar cravings, and boost your health in the process. A win-win! This recipe calls for roasting the squash whole, and then using nearly the entire thing. Consider this a nearly zero-waste food, because with the exception of the stem attached to the squash, literally every other bit and piece of this wonderful vegetable can provide gastronomic joy for you. 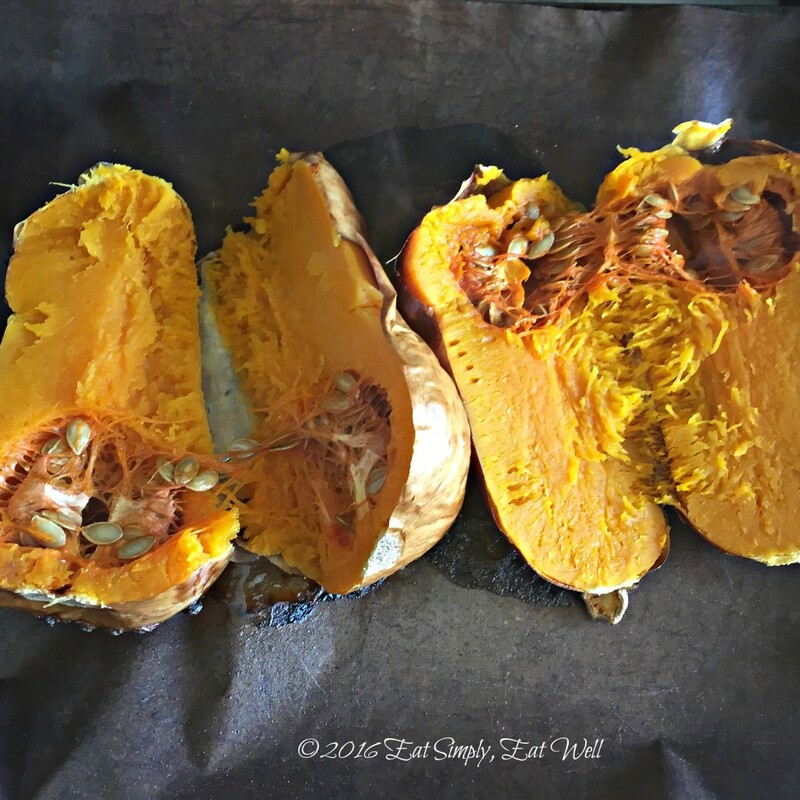 The whole squash can be baked the day before and refrigerated overnight before proceeding with the recipe. The seeds are delicious toasted: remove the flesh from the seeds and toast in a lightly oiled pan over medium heat until they just begin to blacken. Remove from heat and cool slightly. Don’t throw the skin away! Tear it into chip-sized pieces, sprinkle lightly with salt, and fry, in small batches, in a very thin layer of oil in a frying pan until crispy and brown on both side. Woohoo – delicious! You’ll be wondering why you’ve been chucking that skin away your whole life! 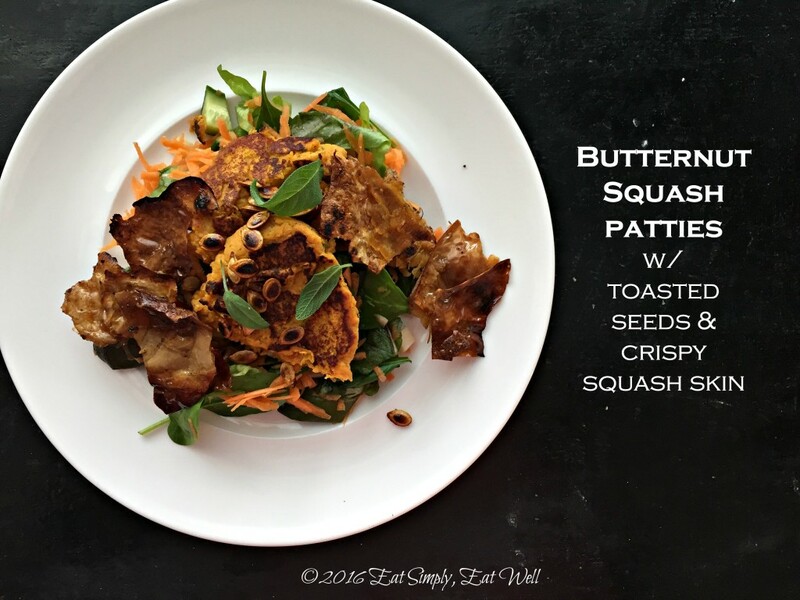 To keep the first batch of butternut squash patties warm while you cook the rest, place a plate into the oven and turn the oven onto its lowest setting. Place the patties into the oven until you are ready to serve. Preheat oven to 200°C/400°F. Wash the squash to remove any dirt or residue. Lay a whole butternut squash onto a parchment lined baking pan, pierce the top several times with a fork, and place the pan in the oven. Bake for 50 – 60 minutes, or until squash begins to collapse and is very soft when pierced with a fork. Remove the squash from the oven, cut in half lengthwise, leave on the pan and allow to cool to room temperature. Once the squash has cooled, remove the seeds with a spoon and set aside. Scoop the flesh away from the skin, reserving the skin for later use (they make seriously good chips when fried in a little oil in a pan, then salted). Place the squash in a bowl and add the nutmeg, cayenne pepper, salt, pepper, thyme and sage. Using a fork or potato masher, mash until smooth. Taste the squash and adjust seasonings to your liking. Add the egg and the chickpea flour and mix until completely smooth. Heat a heavy-bottomed frying pan over medium-high heat. Add 1 tablespoon of olive oil to coat the bottom of the pan. Allow the oil to heat up briefly, then spoon 2-tablespoon sized scoopfuls of the squash mix into the pan and flatten them down into patties. Fry 3-4 minutes per side, allowing each side to cook until golden brown and crispy. Combine all ingredients in a large bowl, and using your hands, mix well to coat the vegetables evenly with the dressing. Divide the salad between 4 plates. Arrange the patties on top of the salad, overlapping slightly. Add a spoonful of yogurt to the top, and sprinkle a few sage leaves or thyme sprigs over the top. 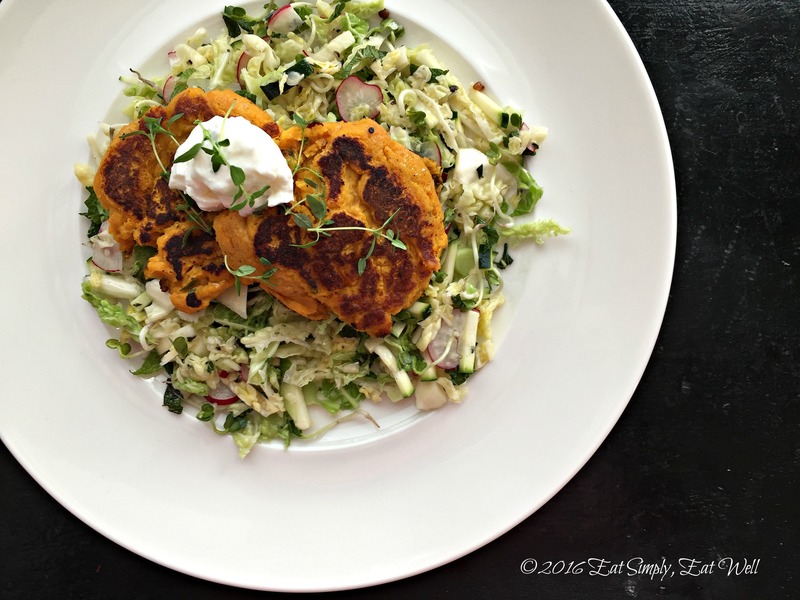 Did you like this recipe post? Let me know in the comments below, and please share it with your friends. Yes, I loved it! Finally made them and they are delicious- better than dessert! I surely shared the recipe! 🙂 So happy you liked them Theresa! Woo HOOO I love butternut squash and am so happy it has finally come to Finland to stay. I always toast the seeds but on parchment with a little salt. I can’t wait to try that skin. And your recipes, totally wheat-free. Love , love, love. Thanks Cynde! 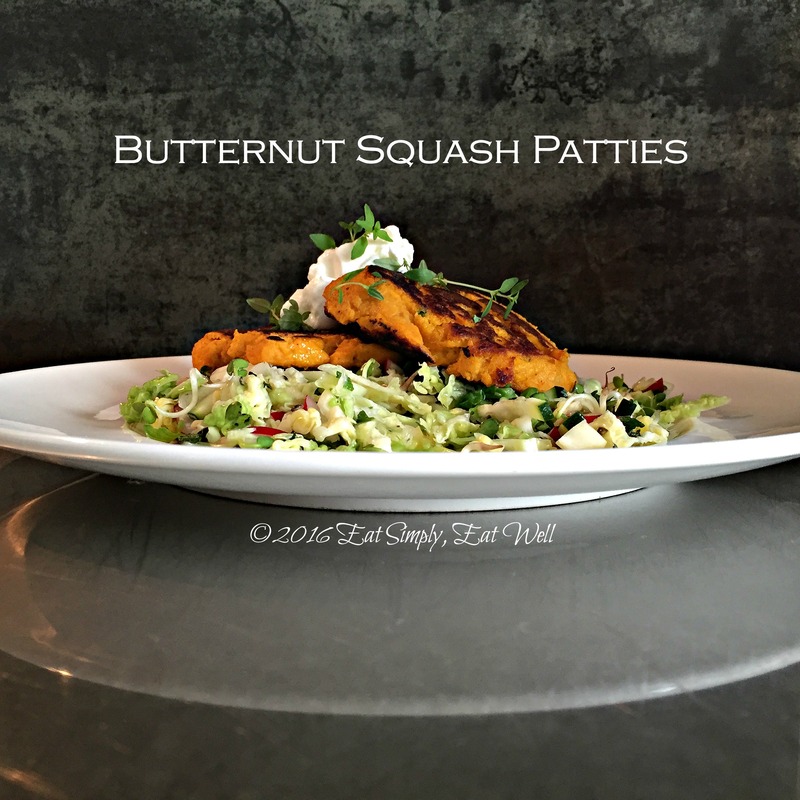 I’m a huge fan of butternut squash too, and have been thrilled to see them available all over the place nowadays! I think you’ll love the skin – better than chips. Enjoy!